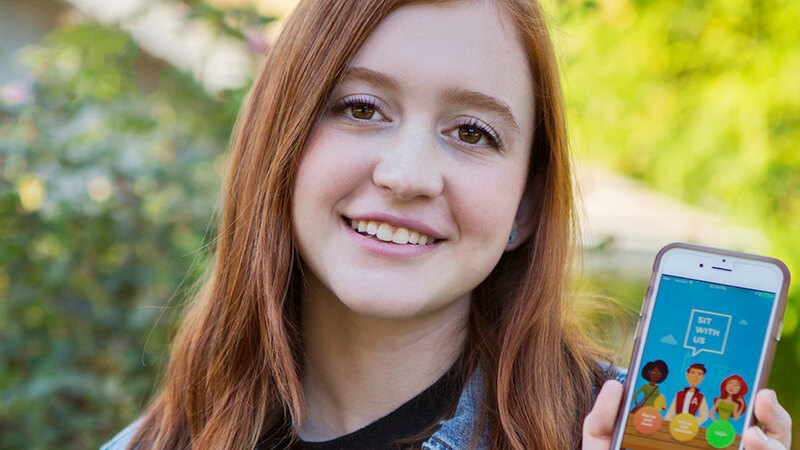 But here's the really cool part: Unlike most apps, this one wasn't the brainchild of some Silicon Valley tech guru - it was created by a 16-year-old from Sherman Oaks, California, named Natalie Hampton. Just like so many teens starting high school, Natalie told NPR that she endured a difficult and isolated freshman year. In fact, she was so lonely that she ate lunch by herself every single day. "When you walk into the lunchroom and you see all the tables of everyone sitting there and you know that going up to them would only end in rejection, you feel extremely alone and extremely isolated, and your stomach drops. And you are searching for a place to eat, but you know that if you sit by yourself, there'll be so much embarrassment that comes with it because people will know and they'll see you as the girl who has nowhere to sit. So there's so many awful feelings that come along with it." Luckily, Natalie was able to switch schools the following year, and made new friends that welcomed her and made her feel less alone. But she's never forgotten about all those silent lunches. It wasn't enough that life had gotten better for her - Natalie wanted to make sure it got better for others, too. What about the other kids who still haven't found their "group"? The ones who still sit where she once did, in embarrassing isolation? "It's a free lunch-planning app where kids can find lunch tables if they feel like they have nowhere to go. Pretty much, kids can sign up as ambassadors for a Sit With Us club and agree to post open lunches so that anyone who has the app and has nowhere to go can find a table and hopefully make some new friends." She says the app makes it anonymous, which eliminates the embarrassment of walking up to a lunch table and getting rejected in person - an experience that can be decimating for most high schoolers. This way, students can plan ahead, but also fall under the radar, signing on incognito and head to welcome tables. "I felt that if I was thriving in a new school but didn't do anything about the people who feel like this every single day, then I'm just as bad as the people who watched me eat alone," Natalie continued. "I felt like, with my story, it was my job to stand up and do something about all the kids who feel like this every day. And I wanted to create something that would address bullying, but in a positive way." Honestly, I can't applaud this brilliant teen enough. She's gone above and beyond to learn from her own painful experience and make the situation better for others. My heart tells me her future will be bright and her example will be shared again and again. I can only hope my own children will follow in her footsteps, and that some day - when I finally concede defeat and get them their phones - this app will be the first one I gift them. You can download Sit With Us for free from the iTunes store, or learn more about the app and Natalie's story on the app's official web page, SitWithUs.io.